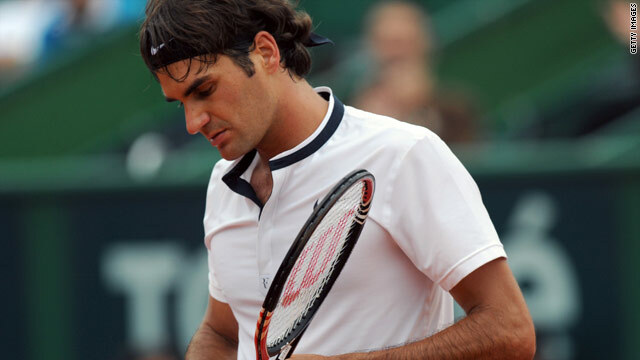 Roger Federer accepts defeat at the Estoril Open in Portugal. (CNN) -- World number one Roger Federer was knocked out of the Estoril Open on Saturday, after losing to defending champion Albert Montanes, 29, of Spain 6-2 7-6 (7-5) in the semifinals of the Portugal tournament. The 16-time champion, who is six weeks away from beating Pete Sampras's record of 286 weeks as the globe's top-ranked men's player, lost to Montanes on a rain-soaked clay court in under 90 minutes. Montanes will now face Portugal's Frederico Gil in Monday's final. However, the 28-year-old Federer -- who beat Nikolay Davendenko to win the event in 2008 -- remained confident about his clay-court form, despite this loss coming on the back of an opening match defeat at last month's Rome Masters. "I'm not worried," Federer told the official Web site of the Estoril Open. "My goal isn't to win 12 tournaments a year, it is the big events: the Masters, the grand slams and keeping the number one ranking. "My decision to come to Estoril was the right decision. I would like to return again in future. I know that good things are around the corner," Federer added. "I'm disappointed to have played a match like this, where I got off to a bad start again. I didn't play that badly in the second set, I had my moments but my movement was a little slow. "I'm lacking matches," said Federer. "I'll keep practicing hard again. Conditions will speed up in Madrid and Paris [at Roland Garros]. I must take positives into the next few weeks." Federer was using the tournament as a warm-up to the French Open, where the Swiss ace will be looking to defend his title when the tournament starts at Roland Garros on May 23. Anastasija Sevastova of Latvia beat Spain's Arantxa Parra Santonja 6-2 7-5 to win the women's final in Estoril. Meanwhile, world number two Novak Djokovic pulled out of the Madrid Open on Saturday due to continued breathing problems. An allergic reaction to pollen in the air forced the 22-year-old player to retire from a game at the Serbain Open on Friday.